I go bananas for books featuring female characters with agency. I go crazy for stories where the heroine’s story is her own, and she isn’t immediately (or at any point of the journey) chasing after a male stud. I go berserk for novels where the ‘strong’ female lead is something other than an Arthurian / Christ figure; a great redeemer whose motives and background are as pure as her faultless morals. I like grit. I like interesting women. I hate when the first word used to describe a woman, or a young girl, is “nice.” For these reasons, and many more, I knew I was going to like Adelina Amouteru. Her motivations are dark and her past is fractured. The way Marie Lu twisted my expectations and surprised me again and again was breathtaking! Thank you, Marie Lu, for not underestimating your reader. Adelina’s story hooked me right away. Her relationship with her abusive father was heartbreaking, bitter, and yet full of honesty, which transcended the fantasy setting. 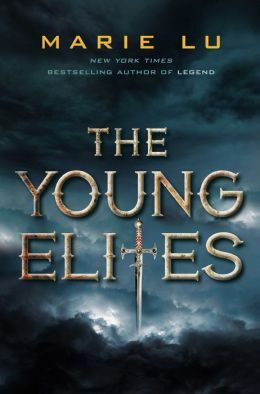 Not to mention Adelina’s unbreakable tether to her sister, which seemed to keep her humanity in check, was deeply felt throughout The Young Elites. This tale is shadowed in darkness, and I found this raw approach to storytelling invigorating, reminding me of one of my all time favorite books, Deerskin by Robin McKinley. Where again, a young woman’s journey away from violence is at the heart of the telling. I didn’t even mind the multiple perspectives of the characters that switched between chapters, because Lu used them appropriately so that the plot was advanced (in an unsuspecting twist) with each different voice we heard. I loved the intrigue behind the Dagger Society, particularly the hint that there could be more groups of Malfettos. In fact, I got the feeling that this book was really setting the stage for more world building and a further complicated plot line in the next installment, to which I say, go ahead and raise hell, Adelina! I’ve got your back, girl! This was one of a few books that came out in the fall that I considered checking out, but haven’t bought yet. Maybe I should. Nice review, Kat! Thanks! Yeah, I’ve heard some people say that it’s a little slow, but I really responded to this book. She is a unique heroine! You should definitely check it out. I can’t believe I’ve never heard of this book before. It sounds absolutely fantastic.